Everything we had read and researched had said it would be two years till we saw more – and they were spot on. We inherited these pineapples from our friend Chris in Brisbane, just before we moved here. And almost from the day we arrived they have been sitting near the driveway in the blazing sun. Well they must like it – even with the occasional lack of water – because they have been productive, and are about to be again. 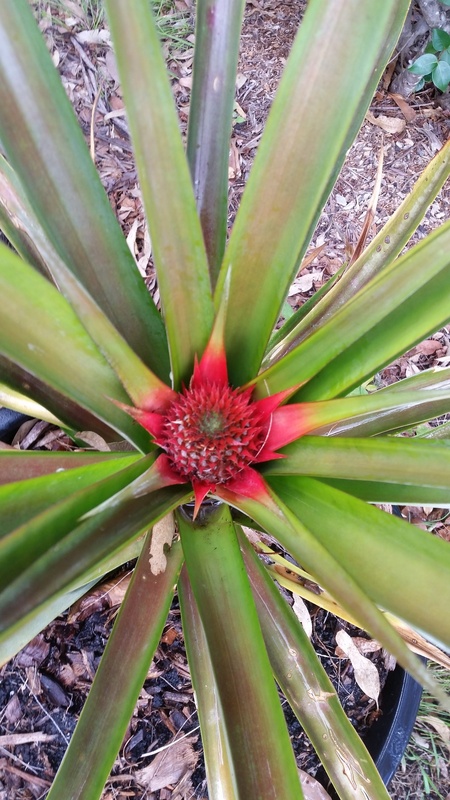 We have 5-6 other pineapples “heads” in the ground, in the driveway gardens, but with the lack of rain and high temps over Summer we have not seen a lot of growth from these new ones. We are confident that over time the new “heads” will take and we will get more than ONE pineapple per year! 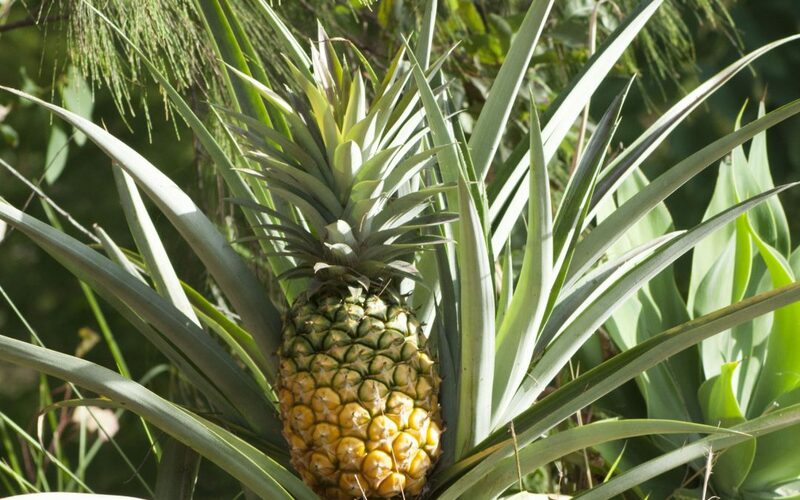 In case you didn’t know… You can grow pineapples from a Pineapple! Cut the spiky head of a pineapple and remove all of the fruit part, and remove a few of the bottom leaves. Dig a small hole, and plant the pineapple head. Backfill, sprinkle on some water and walk away. It’s that simple. Pineapples do not need watering, and will grow just about anywhere. Within two years.. you should have a new pineapple. 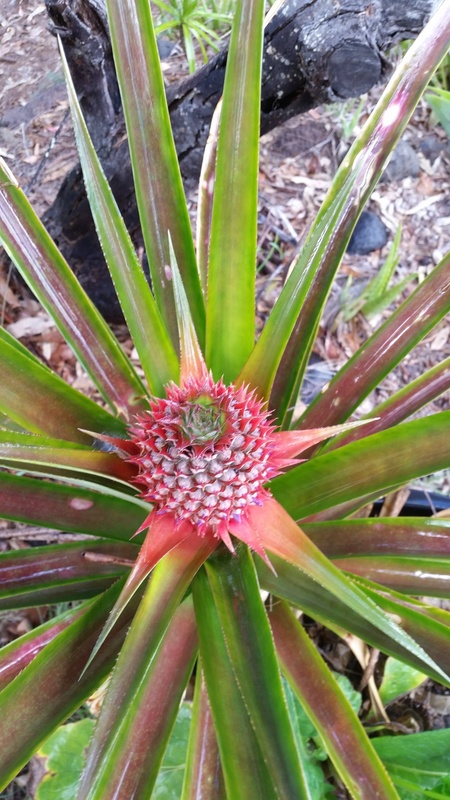 Each of the pineapples appeared as new frond growth at first, but then both developed the pretty pink/red “flower” that you can see in these two images. 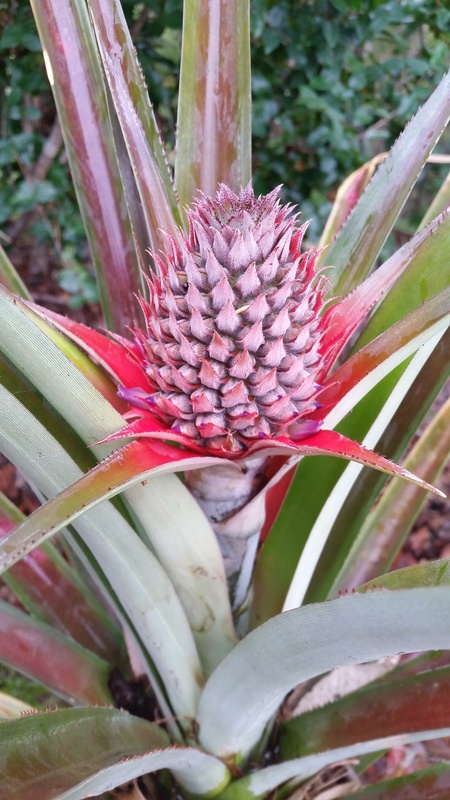 The fruit fairly quickly appears and it looks like a tiny pineapple within a few weeks. It will take around 2 years for the fruit to fully develop, though it can sometimes be faster. The top photo on this page is one of ours from 2 years ago. I am told they were delicious.